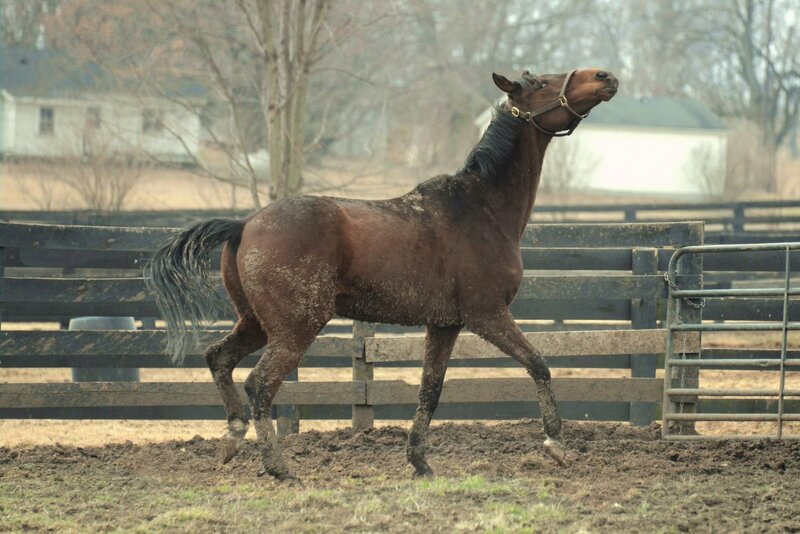 The Spring Meet at Keeneland has been exciting, but the best race day of all in the Blue Grass this month was the Easter Evening Meet at Old Friends. 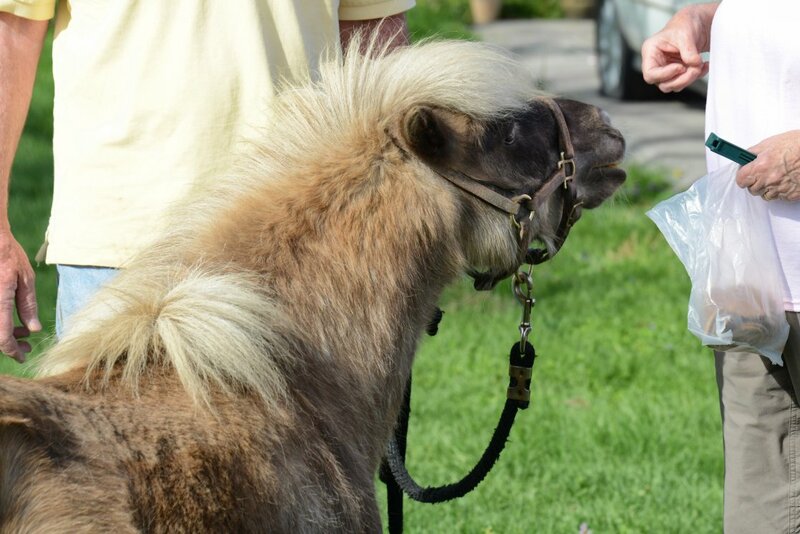 Sunday evening’s race card featured Little Silver Charm’s challenge to all comers. 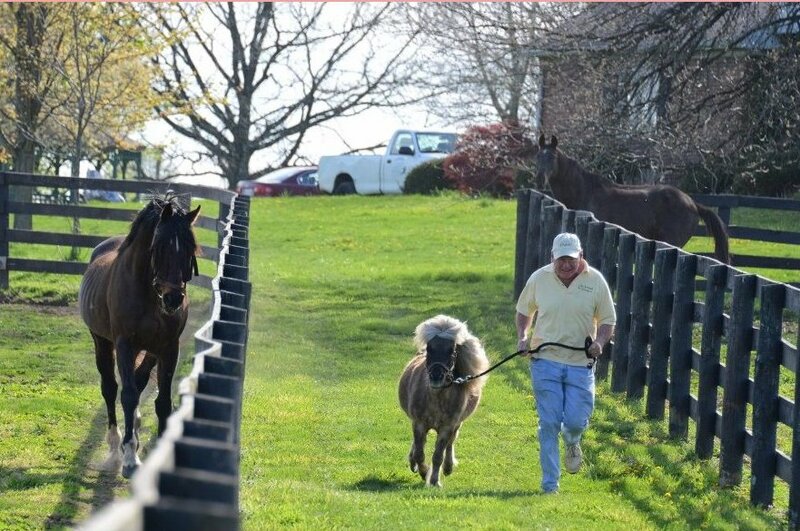 The gutsy little contender strutted onto the green April turf, ready to try a match race with any who dared. No horse is too famous, no graded stakes winner too fleet, for the diminutive, but dauntless, LSC to take on. Before post time, the spectators’ scene seethed with activity while the challenger carefully checked out the turf. Michael calls in his final bets. Beth gets a hot tip from Ogygian. Bebe, occupying the best box, seems more interested in just being seen. 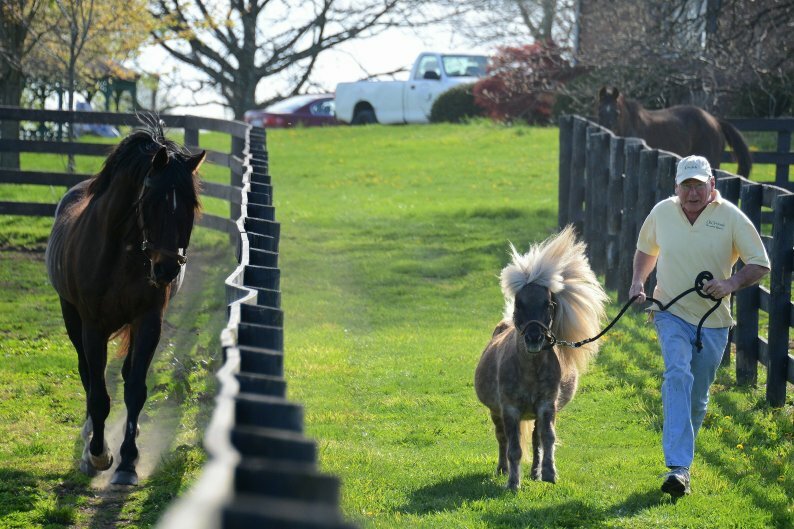 For the first race on the card, Little Silver Charm paraded to the top of the run, with Michael Blowen up. Or rather, beside (since, as Kent Desormeaux once discovered, LSC does not do “up”). There his opponent awaited him— None other than the always-game Swan’s Way. Swannie, a 25 year old bay with the formidable experience of 81 starts under his belt, was on his toes, ready for any challenge. LSC broke sharply. Seizing the lead, he dashed down the track, mane and tail flying in the sunset. Under hand urging from his jockey, he showed masterful turn of foot alongside Swan’s Way’s paddock until Swannie had no choice but to charge into a full trot. Swan’s Way’s longer strides swallowed the ground and he passed the mighty mini for a three length win. Johannesbourbon, Diane, John, Laura and Beth cheered them on from their spots right on the rail. JB may actually be cheering for himself. 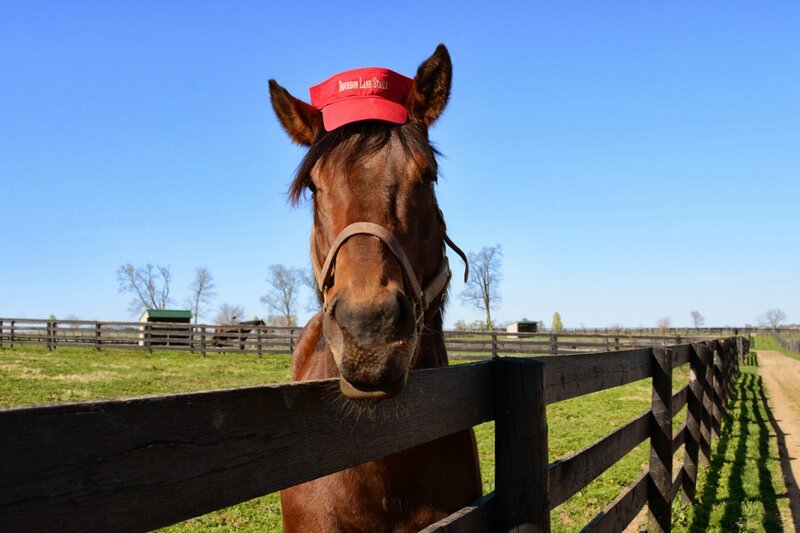 Note that he sports his own Bourbon Lane Stable gear. 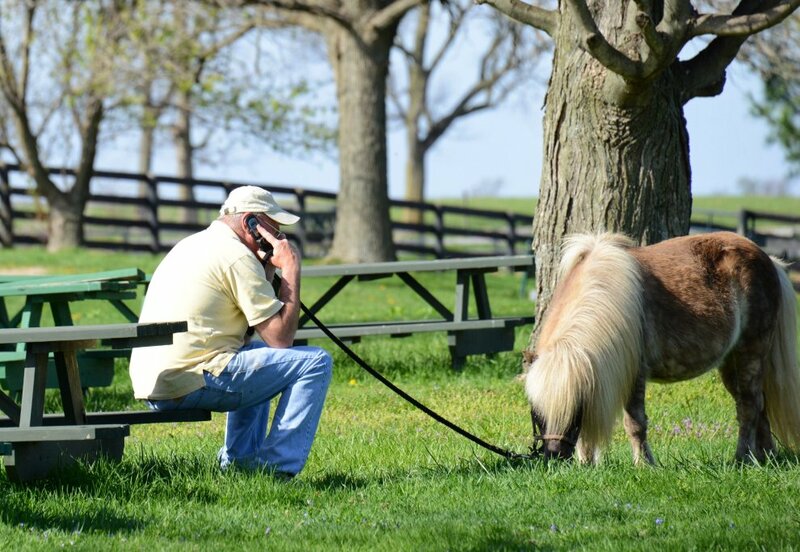 Yet, Little Silver Charm wasn’t ready to throw in the towel. Not yet. Maybe a jump up in class was what he really needed. Negotiations followed (while Kiri’s Clown watched in the background). 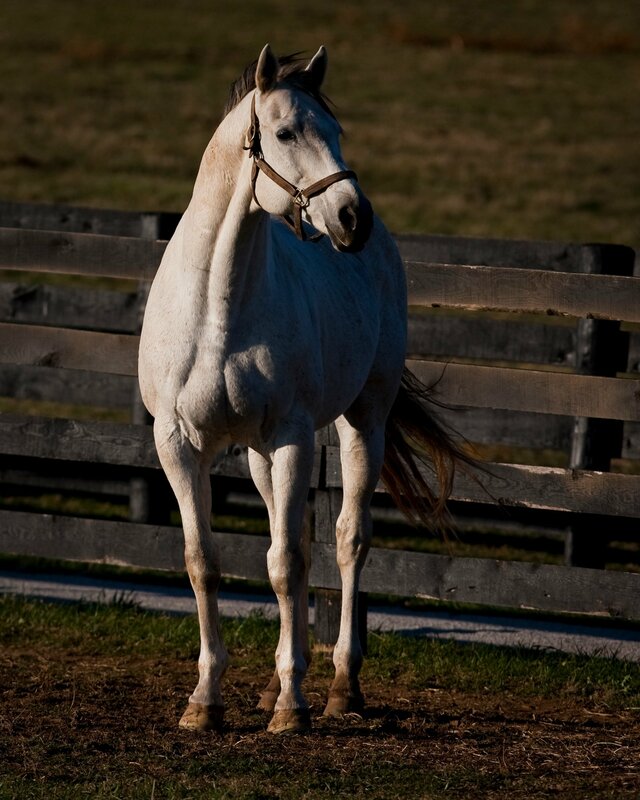 What about 1989 Breeders’ Cup Turf winner Prized? Would he dare to take on the Miniscule Monster at his own game? LSC also decided a jockey change might help. So he fired Michael and welcomed John Bradley aboard. 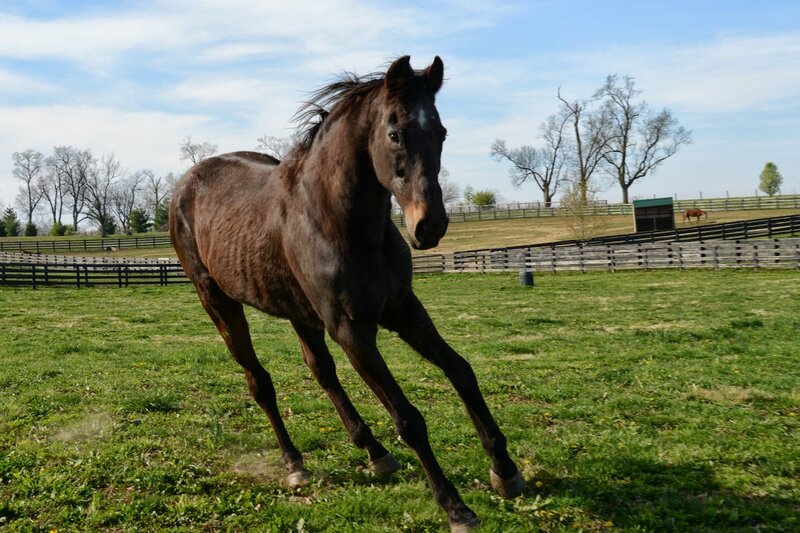 Now the star of the farm, the Chaser of Dreams was rarin’ to go again! Not so, Prized. He turned and ran in the other direction. Oh, well. Prized goes his own way. Then, just as all seemed over, Prized revved up his famous closing style. Steadily the Breeders’ Cup Turf winner diminished the distance at a decidedly swift walk. At the very least, he was curious to see what the mini was up to. But it was too late. 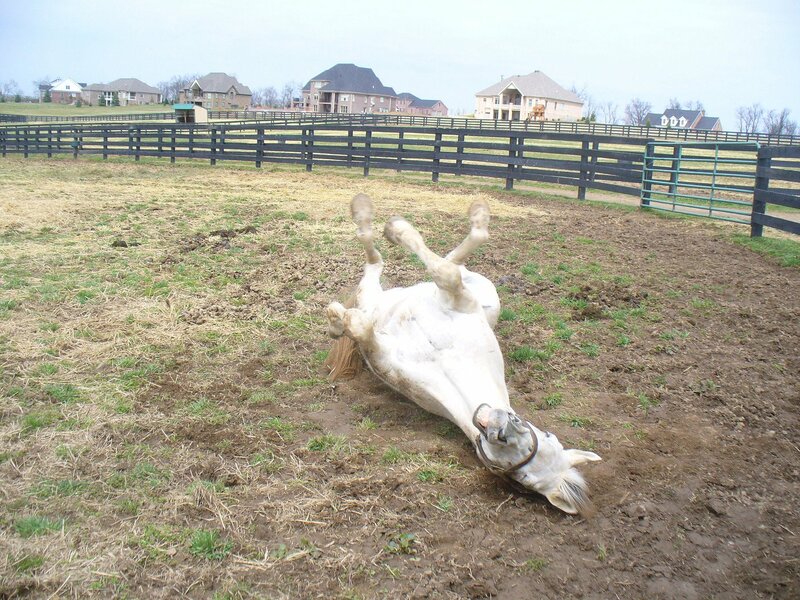 Silver Charm passed the last fence post well ahead. Prized decided he was more interested in nibbling some more grass, anyway. A Grade One Easter was had by all. Bull Inthe Heather, Ferdinand’s greatest son, was an original in his own right. Readers who visited him recently know that Bully was fighting an infection, besides his tendency to abscesses, which worsened with old age. 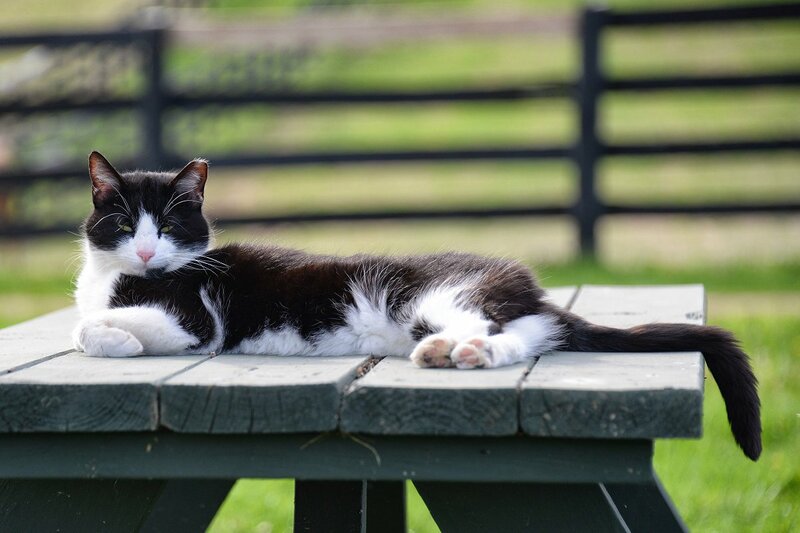 For years Bull benefitted from the best of long-term foot care from Dr. Bryan Fraley, In his final illness he also had everyday treatment from Dr. Bryan Waldridge and others of our new vet team, along with the knowledgeable, devoted care of the barn staff. During the bad weather he had the best stall in the barn, and plenty of attention and company from staff and volunteers alike. We hoped his strong spirit could prevail as it had in the past. But “old age” are the operative words in why that didn’t happen. Bull Inthe Heather was 24, equivalent to almost 80 years old for a human. Even the strongest will can’t prevail forever. Because wasn’t Bull’s first battle. He did prevail. He did live to fight other days—but what matters is that he lived to enjoy most of them. Bull rolls and smiles. March 2010. B. Shannon. For his years of security and enjoyment, Bull had his dad to thank. 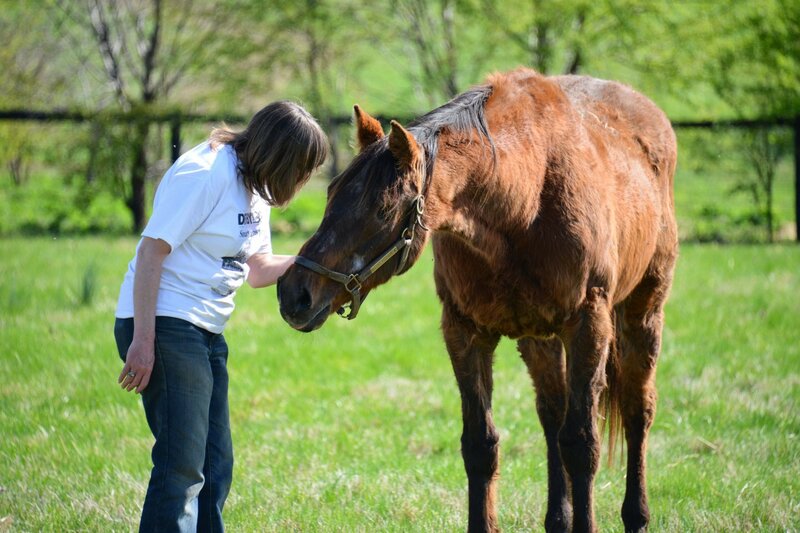 Without the response of racing fans, and other animal lovers, to 1986 Kentucky Derby winner Ferdinand’s tragic demise in an overseas slaughterhouse, Bull Inthe Heather would not have had Old Friends to retire to in 2006. Among the great things Ferdinand achieved, inspiring the support that provided his best son with eight years of security and love was not the least. I know that many people who have the Breyer model of Bull, or gave the real Bull a back scratch, or admired his tall, silver-grey good looks, will feel something missing from the farm when you visit. Without Bull, something definitely is missing. But he had the best of care and everyone’s love. We did our best to help him fight for his life until the point came when the only loving thing to do was allow him to go. If you’d like to join us in honoring Bull and live near Lexington, gather with us this Thursday, April 10, for the “Hops and Horses” fundraiser 6-9 pm at West Sixth Brewing on the corner of West Sixth and Jefferson. The event features a glass commemorating Bull with artwork by Anjelica Huston. 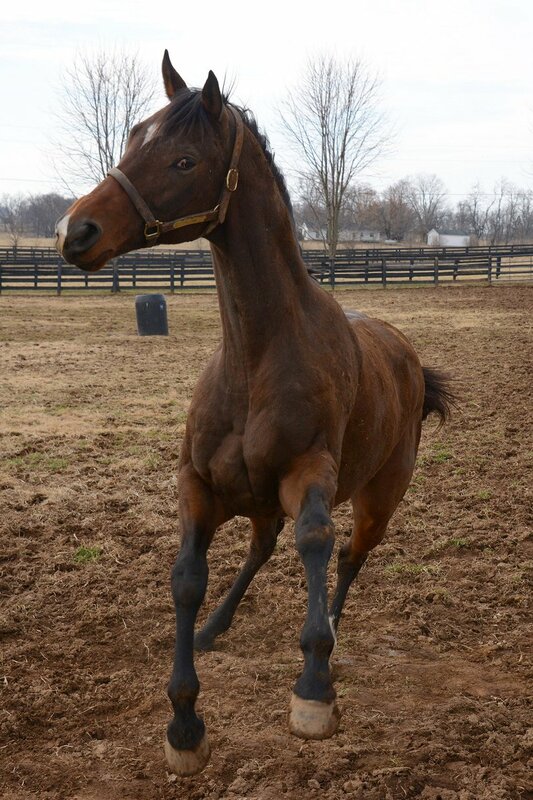 We intended to celebrate Bull Inthe Heather, Florida Derby winner and Kentucky Derby contender. Now we will remember and miss him. But we will still celebrate Bull’s accomplishments, his strong spirit, and no doubt his quirks. He truly was one of a kind. 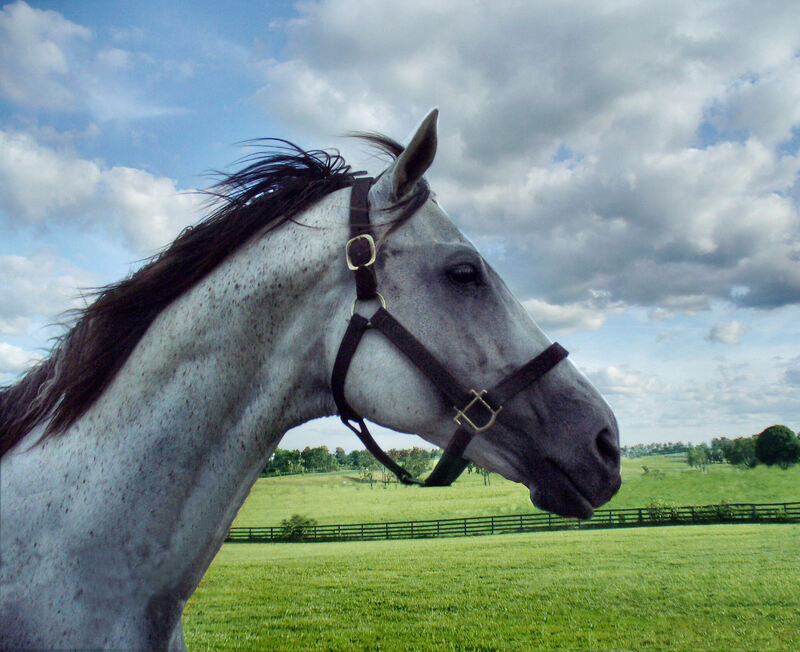 If you can’t come to “Hops and Horses,” you’re warmly invited to join us in honoring the horses who have passed on this year on our annual Memorial Day commemoration at Dream Chase Farm. Bull on a breezy summer day. Spring is here! 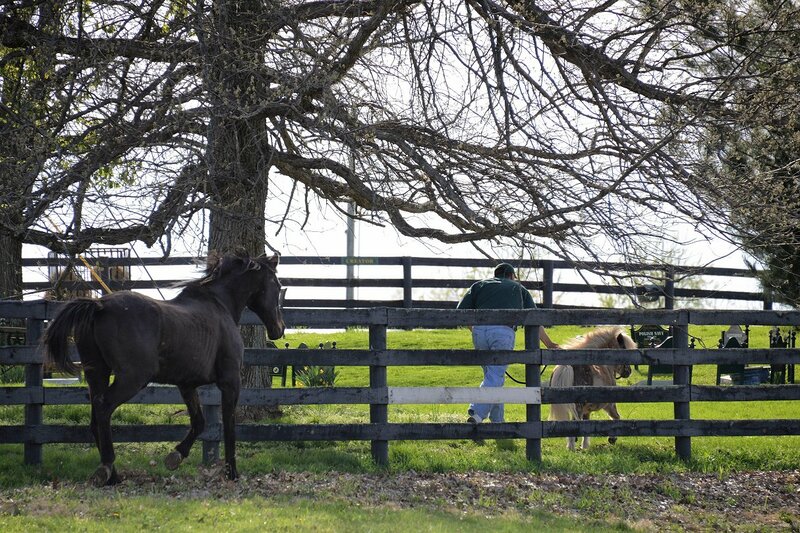 Tender green grass is sprouting, the horses are grazing with zest, and everybody’s starting to shed their winter coats. With the warmer weather comes a relaxed mood. Sarava, who doesn’t care for a pat on the nose in the winter, has been graciously accepting them. Eyes are soft, body language spells a growing contentment all over the farm, and playful little paddock dances are happening all around. The new horses are settling in nicely. The newest boy on the block, Highland Ack (grandson of the great Ack Ack), has joined Dinard’s herd in the paddock next to Arson Squad and I’m Charismatic’s. 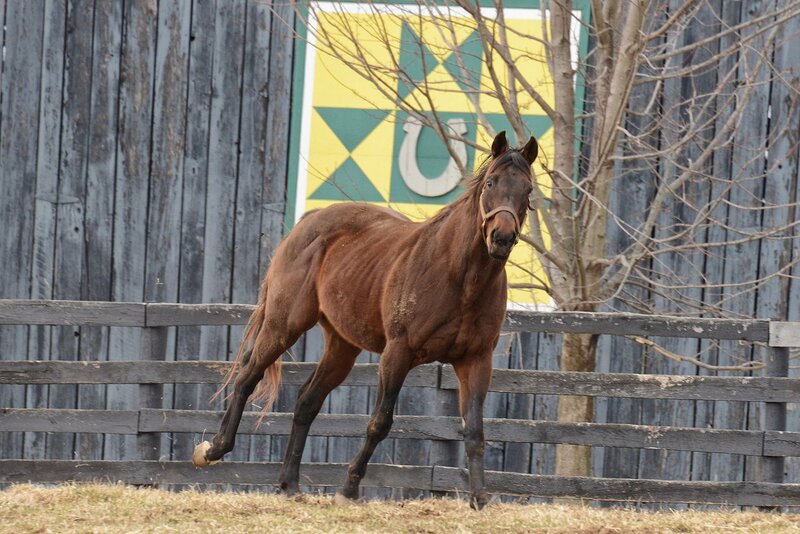 Nicknamed Landy by his former exercise rider, who retrained, showed, and cared for him when his racing days were done, Highland Ack is a real sweetie! Newbies Maybesomaybynot, Bobby Sands, and Geronimo have been joined by Shadow Caster, who had been living at our nearby satellite location. Shadow Caster, by the way, is by Futural’s sire, Future Storm, a son of Storm Cat. And Johannesbourbon is making friends with every human he sees. With the warmer breezes and green grass, the visitors are starting to show up in more numbers, too. That’s always one of the best signs that winter is over. The horses are loving the more frequent carrots and admiration. The spring meet at Keeneland is about to begin. The Derby trail is heating up. The tour guides are eager to introduce you to the new horses and facilitate good times with your favorites from your earlier visits or your memories of their racing days. 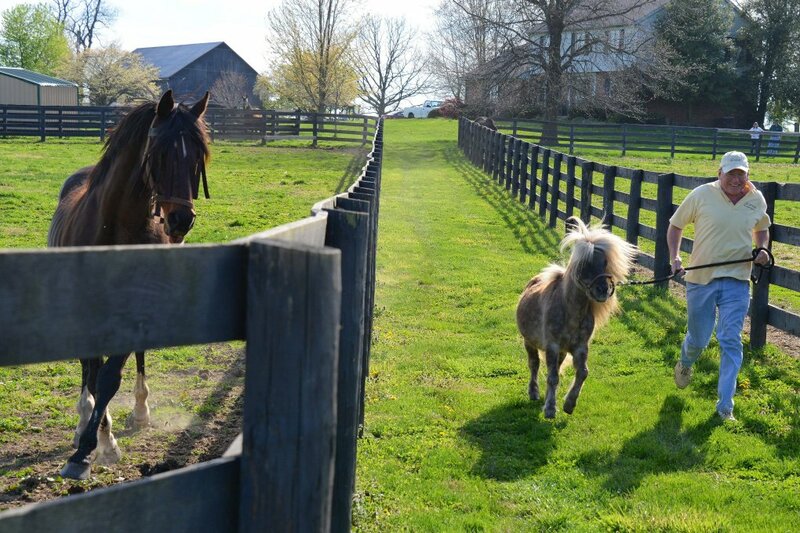 We hope to see you at Dream Chase Farm in Georgetown, Kentucky soon! 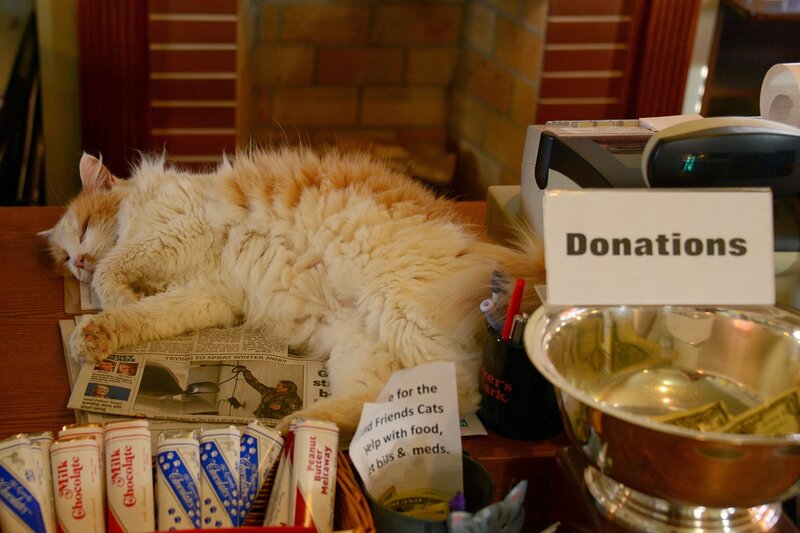 And our helpful office staff (a.k.a. Buddy – also Lucy and Desi -) look forward to your next visit!